The release of Julia 1.0 is now ready to change the technical world by combining the high productivity and ease of use of Python and R with the lightning-fast speed of C++. 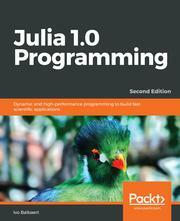 Julia 1.0 programming gives you a head start in tackling your numerical and data problems. You will begin by learning how to set up a running Julia platform, before exploring its various built-in types. With the help of practical examples, this book walks you through two important collection types: arrays and matrices. In addition to this, you will be taken through how type conversions and promotions work. In the course of the book, you will be introduced to the homo-iconicity and metaprogramming concepts in Julia. You will understand how Julia provides different ways to interact with an operating system, as well as other languages, and then you'll discover what macros are. Once you have grasped the basics, you&apos;ll study what makes Julia suitable for numerical and scientific computing, and learn about the features provided by Julia. By the end of this book, you will also have learned how to run external programs. This book covers all you need to know about Julia in order to leverage its high speed and efficiency for your applications. Julia 1.0 Programming is for you if you are a statistician or data scientist who wants a crash course in the Julia programming language while building big data applications. A basic knowledge of mathematics is needed to understand the various methods that are used or created during the course of the book to exploit the capabilities that Julia is designed with.